Trigonometry: Finding the missing side or sides or the angle of the right triangle that you are solving. We first you will have to find which sides are each the hypotenuse, the opposite and the adjacent. The hypotenuse is across from the right angle, the opposite is across from the reference angle and the adjacent is beside the reference angle. 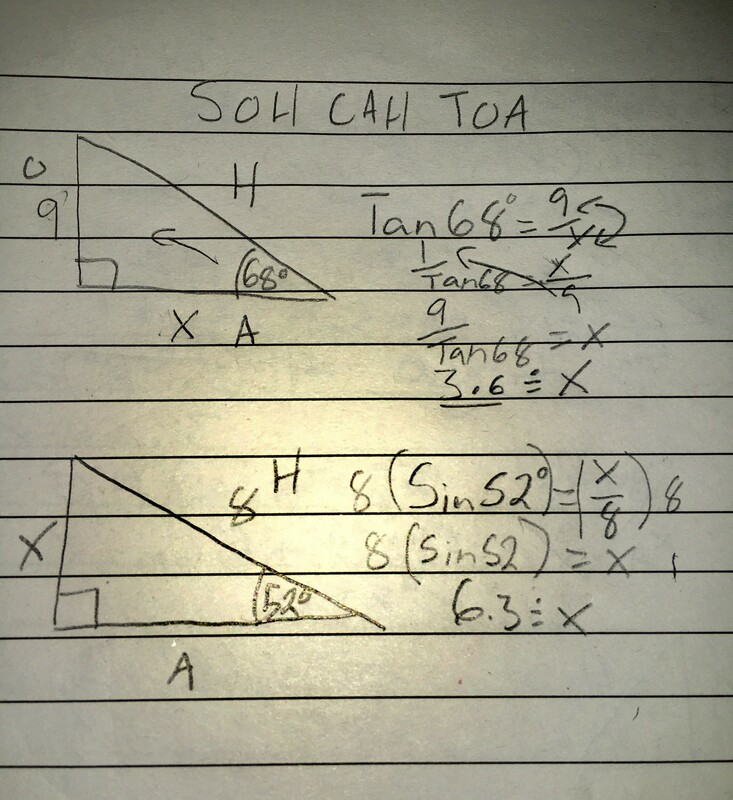 solving using SOH CAH TOA can help you find which button to press on our calculator (sin, cos, tan) SOH is sin = opposite / hypotenuse, CAH is cos = adjacent / hypotenuse and TOA = tan = opposite over adjacent. Also if the X is on the bottom of the faction you will have to reciprocate both sides to get the X on top. 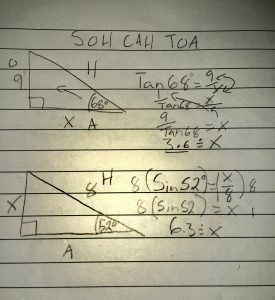 Trigonometry is important to know because it is used in all the upcoming courses in math like pre calc 11 or foundations 11, it is also important because you can link it to other units in math to help you find the answer easier, like geometry. Factor polynomials:Factoring polynomials is like breaking the equation down and finding its original numbers that made up the equation. Sometimes the equation can have a pattern, they can all divide by the same number. The phase CDPUE which is can divers pee easy underwater, The C in the stands for common which means you need to figure out if the numbers have anything of common. The D stands for difference of squares, The P is pattern. The E is easy so just look to see if it is an easy question. Then lastly U which stands for ugly this is when there is a non square number in front of the polynomial if it is this one you can’t use the rest of the rules. Factoring polynomials is important to know and learn because it is a major use of algebra, and can help you understand algebra better in the coming years like grade 11 and 12 math. 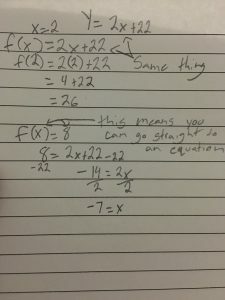 Functions and relations: Functions are types of relation with only 1 connection with another number or variable or basically a special relation ship that you only have 1 of.Function notation is a way a function is written and it is a different way then using the both X and Y in an equation. It is meant to be a way of giving information about the function without being a very long equation or explanation. The functions are usually a single letter like F or G or basically any letter. Understanding Functions and relations is very important because it is a basic necessity to understand the X and Y values of a graph, and if you don’t understand the domain and range then you might get the X and Y axis mixed up. 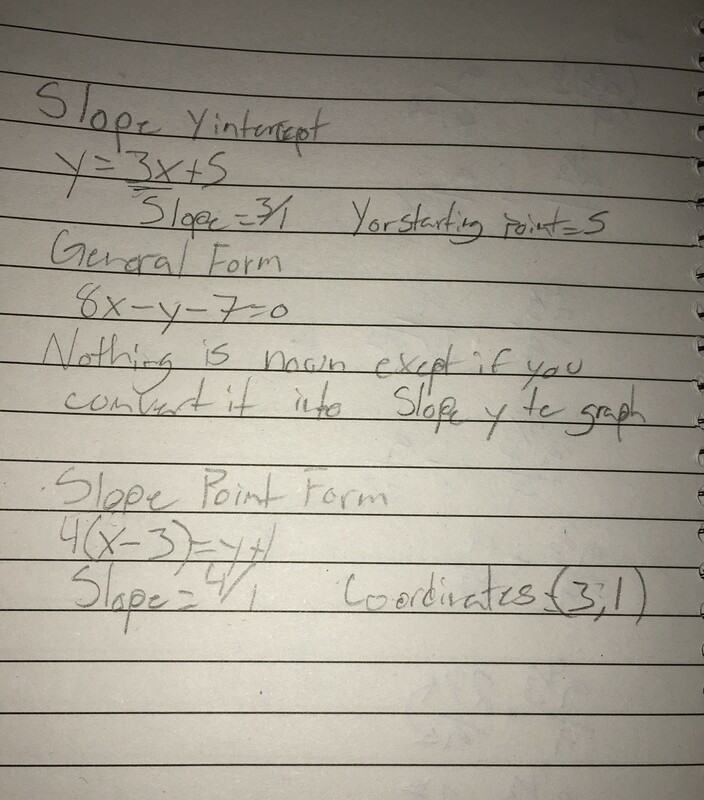 Slope:The slope of a line is containing the x and y axes is generally represented by the letter m, and is defined as the change in the y coordinate divided by the corresponding change in the x coordinate, between two distinct points on the line. Slope is calculated by finding the ratio of the vertical point to the horizontal point between any two points on a line. Sometimes the ratio is expressed as rise over run (rise being Y and run being X). Slope is very important to know because it can calculate the distance between 2 points on a line and it can calculate the point that 2 lines meet with only the slope given. 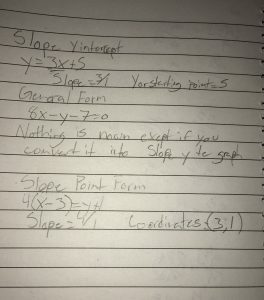 Slope also has 3 different equations that can all be converted into the same equations, except just they can show different things on a graph, or like general form it shows you nothing except if you change it into another form. Systems of linear equations: A system of equations is a set or collection of equations that you deal with all together at once. A system of linear equation comprises two or more linear equations. The solution of a linear system is the ordered pair that is a solution to all equations in the system. One way of solving a linear system is by graphing. 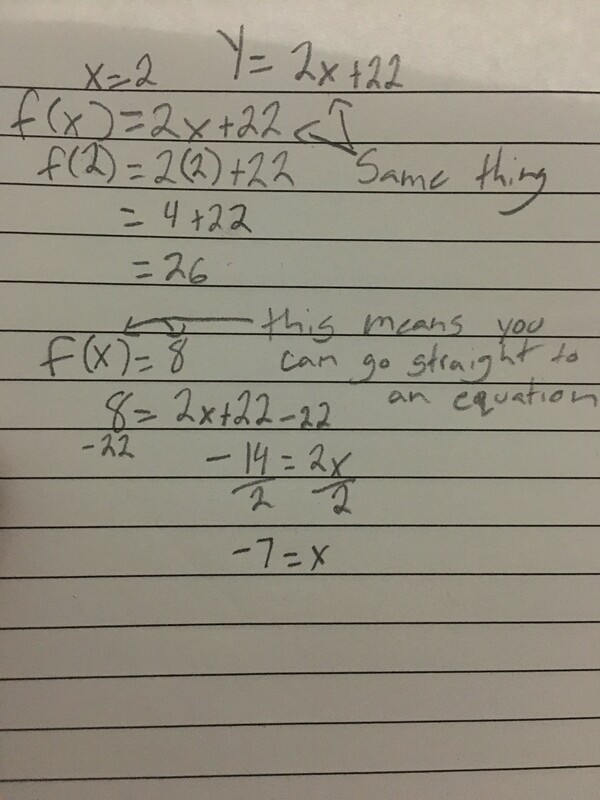 The solution to the system will then be in the point in which the two equations intersect. A way to solve a linear system algebraically is to use the substitution method. The substitution method functions by substituting the one y-value or x-value with the other. Another way of solving a linear system is to use the elimination, in elimination you either add or subtract the equations to get an equation in one variable. System are very important to understand because it is used in many different areas in algebra and graphing and is worked within a lot of the units next year in grade 11 and 12 depending on what class you are in.